Let’s see how Patty is recovering from her conflict with Hal Lindsay……. The paper talked about a new SAC (tin-silver-copper) lead-free solder alloy that contains a small amount of manganese. Apparently, the manganese modifies the metallurgical structure and enables the alloy to perform well in both drop shock and thermal cycle tests. She finished the article and decided that she needed to look into this alloy more. It isn’t common for an alloy to perform well in both drop shock and thermal cycle. The title also reminded Patty how relieved she was that their St. Paul facility was getting ready for Medical RoHS on July 22, 2014. She then checked her email and saw she had a note from ACME CEO Mike Madigan. I just read an article about the death of the PC. PC sales are off by 10% per year. That means in 10 years they will be gone. PCs are 30% of our business. Develop a plan to modify our business so that we can replace this loss. Be ready in two weeks. Patty had to chuckle at Mike Madigan. He seemed to totally lack social skills. She wondered how someone could get so far in the company without them. Anyway, she had a new assignment. Also, she quickly determined that a business decreasing 10% per year would still be at about 35% (0.9^10= 0.349) of its original size in 10 years. Right off the bat, her sense was that the “Death of the PC” was exaggerated and misunderstood. She performed a search and read some more articles, finding several that talked about the surge of tablets like the iPad and the Kindle Fire as being behind the PC’s decline. She and Rob owned two iPads and one Kindle Fire. Were they part of the trend? She suspected that there was more to the story and thought that discussing this topic with The Professor would be interesting. She was visiting him at Ivy University later in the week. The week went by quickly and, before Patty knew it, she was in her car with her husband Rob, driving the two hours from Exeter, NH to Ivy U. Rob was getting his PhD there, part-time, and made the trip several times a month. The Professor was his advisor. Rob needed an hour with The Professor. During that time, Patty checked her email. “That’s great! Simon Pearce is my favorite restaurant, Professor,” Patty responded. 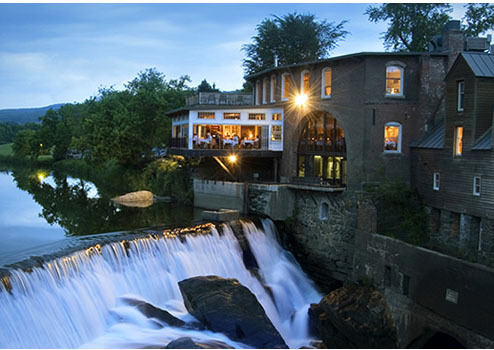 Simon Pearce Restaurant in Quechee, VT. They both looked at Rob, but he had so much work to do that a slice of pizza from the student union was his destiny for lunch today. As Patty and the Professor arrived, Simon Pearce was at its most beautiful. The sky was blue and the leaves were just starting to turn. Patty had alerted The Professor that she wanted to talk about the “Death of the PC,” so he was ready as they sat down. “Patty, I have read all of the articles that you sent. They emphasize the impact on the PC by tablets and mobile phones, but they miss an important point,” The Professor began. “The effect of the constancy of 'Memory Metrics,'” The Professor replied. “What are 'Memory Metrics? '” Patty asked. “Let me explain with a story,” The Professor answered. 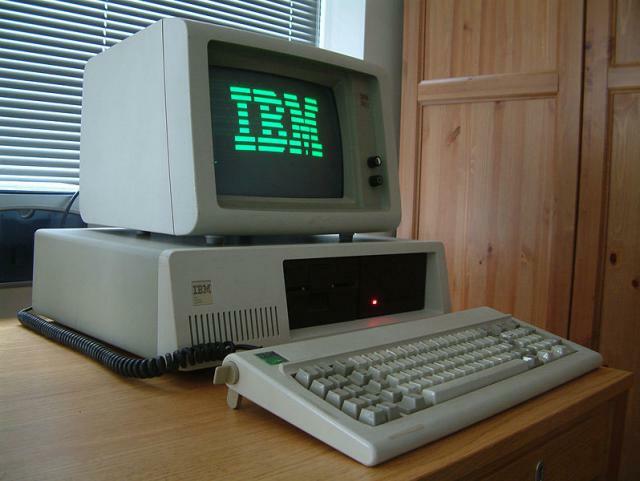 “When you were a toddler, back in 1986, my family got our first computer, an IBM PC XT. It cost $6,000 and had 0.512MB of RAM and 20MB on the hard drive. We had it for 3 years and needed a replacement. Can you guess why? The Professor asked. The IBM PC XT circa 1986. “You ran out of memory,” Patty answered. “Yes, the Kids where playing, ‘Where in the World is Carmen Sandiego,’ and some other games,” The Professor said. “Then we had to get another computer in 1989 with 4 MB of RAM and a 200MB hard drive. We tripled the hard drive memory and still needed a new computer in 1995. This trend continued until about 5 years ago, but it then slowed down,” The Professor continued. “Why did the trend slow down?” Patty asked. “Before I answer that, we need to discuss ‘Memory Metrics,’” The Professor said. “How much memory does a decent photo require?” The Professor asked. “A song?” The Professor quickly shot back. “About 5MB,” was Patty’s fast reply. “Wow, Patty! It’s amazing that you know all of the critical ‘Memory Metrics’. Where did you learn them?” The Professor said. “Rob went to lunch with the professor who teaches a class called Everyday Technology. They discussed these metrics. It helps me to estimate how much memory I need on my smartphone to store all of my photos, songs, and books,” Patty answered. “So how many songs could you store on the hard drive of my first computer?” The Professor asked. “Only 4 or only 20 photos or books,” Patty answered. “So, we weren’t putting songs, books or photos on early computers. Even the $10,000 laptop that I needed for my research in 1996 only had a 1000 MB hard drive…..only 200 songs,” said The Professor. “Memory Metrics, are close to constant, with the exception of perhaps photos with more megapixels. Anyway, the memories on new computers have gotten so large that we don’t need to replace them as often, we just don’t fill the memories up any more. Unless we store movies.” Patty continued. “Add in the advent of smartphones and tablets and see if you can make an argument for why PC sales are down,” The Professor said, beaming at his favorite student. “Well, before smartphones and tablets you might get a new PC even if you didn’t need it. But, now you have two or three devices to buy, so you may put off a new PC for awhile to buy a new smartphone or tablet,” Patty responded. “So, what will happen to smartphones and tablets?” The Professor asked. “A similar thing. They are developing so many features, memory, and computing power, that their sales will slow done in a few years,” Patty thoughtfully said. “So, the PC is not dying!” Patty exclaimed. “Let’s ask my statistics class after lunch,” The Professor suggested. Although Patty had been around campus off and on, she was immediately struck by how young everyone in the class looked. Just last night, Rob was teasing her about her first gray hair. That, no doubt, added to this effect. As the class of 60 students settled down, The Professor began to speak. “Before we start the lecture, my colleague, Patty Coleman, would like to ask you a few questions,” The Professor said. “The Professor calls me a colleague! Wow!” Patty thought. So, Patty stood up and started speaking. “If you could only have one device, a PC or a tablet, who would choose the PC? “ Patty asked. A boy, who looked, to her, to be about 12 years old, answered, “Well, Dr. Coleman, it is very difficult to write a 10 page paper on a tablet, or perform Excel® calculations, or prepare a PowerPoint® file on a tablet." “How many of you own a tablet?” Patty asked. Only about 20% of the students raised their hands. “How about a smartphone?” Patty continued. “Any thoughts on why many people think the PC is dead and the tablet is the future?” Patty asked. After a little murmuring a female student raised her hand. Patty was relieved that she looked to be about seventeen. Patty acknowledged her. “Well, Professor Coleman, my family has two tablets at home. My 7 and 9 year old brother and sister play games on them all the time. My mom and dad use one as an e-reader, and they use one to control our TV. But, for any serious work, even they prefer a PC. Only my kid brother and sister would prefer a tablet over a PC. But, the most recent devices we bought were tablets. Our PCs just haven't needed replacing,” the young women said. “Why do so few of you have tablets at school?” Patty asked the group. Again more murmuring ensued and, finally, a graduate student raised his hand. Patty acknowledged him. “Professor Coleman, I find that the combination of a PC and a smartphone fills all of my needs. I can listen to music or read a book on my smartphone. I can’t not have a smartphone and function at today’s university. A tablet would be a luxury, I don’t feel I need or can afford," he said. With that Patty sat down. This information on tablets and the college scene was consistent with what Patty had read . The Professor's lecture was on Bayes Theorem and Patty decided to stay. She chuckled that the students thought she had a PhD and was a professor. "Yikes, does this mean they think I am old?" she thought. The PC was alive and well.